Today was just one of those days. I apologize that this is going up so late. I had plans to have it up by late afternoon, but .... Anyway I want to share with you these really neat silicone molds that HABA has just come out with. They are perfect for baking or freezing. I have the Summer Flower Mold. It makes a small center cake with a larger flower around it. You could actually do several of the small ones if you wanted to. My daughter and I were discussing what a super party idea this was for a little girl's tea party or garden party. You can do the cake, but we thought it would also be an idea to make several floating ice flowers out of the center to float in a punch. You could make them ahead of time and then make your cake. My daughter is planning this one! Look how cute her first attempt at the cake came out. Next time we are going to use our cake decorating kit. We also thought it would be cute to find some butterfly candies to add. The molds can be used for baking, or you could fill them with gelatin or other frozen treat. Perfect for summer! These silicone molds are perfect for allowing you to spend time in the kitchen with your children. You can have fun and create memories that will last forever. Not to mention how much they can learn while preparing recipes for the molds. HABA also has some popsicle and ice cube molds to add to the summer fun. You can choose from penguins to sea creatures. Be sure to visit their website to see the different molds. You can mix and match from the different molds. the molds are priced from $10-$25. If you can not find them at a local store, you can always order them on the HABA USA website. HABA has a few other new items for summer play. Their new play food. Apple pies, hot dogs and ketchup and mustard to enjoy some pretend play. I know our silicone Summer Flower Mold will be getting used quite a bit this summer. I have always liked silicone molds for baking and these are themed for children. 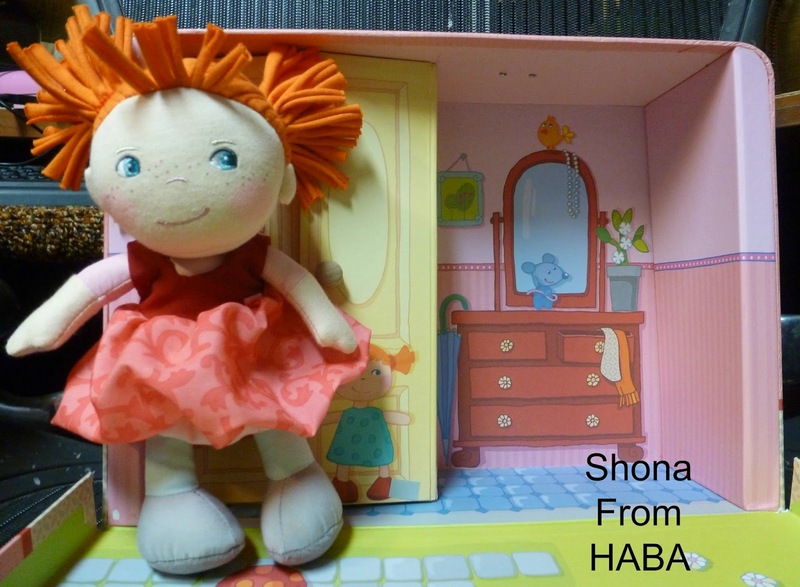 Now, for the giveaway you can either choose the HABA products I reviewed (Summer Flower Silicone Mold and Shona), or you can visit Hope's Cafe and choose the products she reviewed. We are hosting the giveaway together, so you will have your choice. You will not be able to mix and match you will be able to choose one or the other. Thanks for stopping in. See you again soon! Disclosure:I received no monetary compensation for this review. I did receive product for review purposes. All quotes in red are taken from the sponsor's email or website. All thoughts and opinions are my own. Oh wow - I love both sets of products! It's a hard choice, but I think I would have to go with the silicone molds at Hope's Cafe - we have a small silicone ice cube tray that makes musical notes and my kids love to put juice in them and eat it straight out of the tray, so I think the ice cube molds would be a big hit with them! I'd like the Water Party Silicone Ice Cube Tray, and the Safari and Princess Silicone Cupcake Molds that Hope reviewed. I would choose the one you reviewed.. I would take the one from Hopes Cafe. I would choose what you reviewed. I would choose the ones from At the Fence. I would choose the ones from At the Fence! I would pick the ones from At the Fence because I think that flower mold is just adorable! I so loved both! But I really liked the Water Party Silicone Ice Cube Tray so I would chose ones that Hope reviewed. Thank-you for a great giveaway! I choose the flower mold and Shons from your review. too hard to choose but I guess Id choose the molds from hopes cafe. we would have fun with any of these! I would choose the Summer Flower Mold - I have recently tried the silicone products and love them. This one looks great!